Red Distribution has launched ‘Ten Bands, One Cause,’ a retail initiative to support National Breast Cancer Awareness month in October. Ten bands will reissue titles on Sept. 30 on pink vinyl for the cause, which sponsor’s Gilda’s Club NYC. 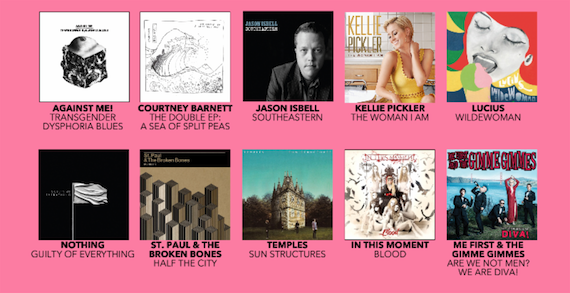 Kellie Pickler, Jason Isbell, St. Paul & The Broken Bones, In This Moment, Courtney Barnett, Against Me!, Nothing, Temples, Lucius, and Me First & The Gimme Gimmes will all reissue titles as part of the project. Limited edition pink vinyl copies will be shipped to retailers nationwide, and $1 of every unit shipped will sponsor Gilda’s Club NYC. Among those titles are Pickler’s The Woman I Am, and Isbell’s Southeastern. Gilda’s Club NYC is a non-profit created in memory of Gilda Radner, an original cast member of Saturday Night Live. Radner died from ovarian cancer in 1989.